Who Said Limbaugh Doesn't Listen? Radio talk-show host Rush Limbaugh told his listeners Monday that an ear implant has partially restored his hearing. Limbaugh had an electronic device placed in his skull late last year, and the final hookup, which partially restored his hearing, took place last week. "When you've had, in my case, over 50 years of normal hearing and to lose it suddenly, as I did, it's ... a shock," said Limbaugh, who went deaf last year because of an autoimmune inner-ear disease. "You adapt to it, as you have no choice, but you ought to try it." 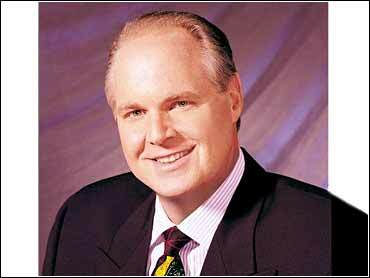 Limbaugh, who has 20 million weekly listeners on about 600 radio stations, said his mind played tricks on him at times. "I was hearing the soundtracks to westerns," Limbaugh said. "It was as loud as can be. It was distracting. I knew I wasn't hearing it because those noises weren't being made." Limbaugh had continued to do his show as his hearing deteriorated and eventually disappeared. He used an elaborate setup at his South Florida studio involving transcribers and computer screens to read listeners' calls. Limbaugh said he is having to relearn how to hear. Voices are a bit fuzzy, like they have been recorded on a minicassette recorder, he said. But during one-on-one conversations, his hearing is about 90 percent normal. "I am pretty dependent on what people's lip movements are, although that is improving every day," Limbaugh said. Limbaugh warned his listeners that telephone calls have so far posed the biggest problem for him, saying he'll have to "wait and see" if that improves. If not, he'll still use the setup devised when he was deaf. Limbaugh said he never was really depressed about his deafness, and was grateful there was a chance he could regain his hearing. "I was just constantly thankful ... for the era in which I was born because that is what has made this all possible," Limbaugh said. "That and the freedom we all have as Americans to invent and create and explore all these medical marvels."